When Aisling’s mother dies, she is heartbroken. Her father remarries quickly and unexpectedly, bringing his new wife and her two daughters to live with them in the house in Rook Hill, at the edge of the Wood. Then her father dies as well, and Aisling is left alone with her strange new family. Abused by her stepmother, Aisling loses herself in fairy tales, reading and rereading her favourite stories. Defying all caution, she takes long walks in the Wood, hoping to be stolen away by the fairies. But a powerful fairy lord who calls himself Sidhean makes himself her protector, denying her desire. Thus able to pass safely in the Wood, she meets Kaisa, the King’s Huntress. Aisling owes Sidhean for the wishes he has granted her, but with Kaisa in her life, she is suddenly reluctant to pay. Malinda Lo’s Ash uses many of the elements of the various versions of the Cinderella story, while also incorporating a magical wood, a common set piece in many other fairy tales. Lo’s world-building exceeds what you might normally find in a fairy tale, incorporating the role of the King’s Huntress and fleshing out the kingdom that surrounds the story. And Lo’s fairies have the bite of the older tales, rather than the fluffier friendliness of Cinderella’s Disney godmother. Sidhean has long protected Aisling from the other fairies, telling her it isn’t time, but he seems to constantly struggle with the temptation to take her himself, complicating matters. By tweaking the traditional narrative, Lo also interrogates the idea of marrying for money. Both Aisling’s father and her stepmother marry with this high on their minds. Aisling’s father because his business is in trouble, and her stepmother because she cannot offer her daughters the advantages she thinks they deserve with only her inheritance to live on. Each is bitterly disappointed and Aisling pays the price. Her oldest step-sister Ana is under tremendous pressure to marry well in order to remedy the situation. There are several interesting exchanges between Aisling and her younger stepsister, Clara, who is caught up in the romantic idea of marrying a prince, serving as reminder to Aisling that some people want the things that hold no appeal for her. Throughout the tale, Ash explores the theme of home, and how home is not a place, but the people who love you. Aisling finds herself following the paths of the Wood back to Rook Hill several times to visit her mother’s grave. But of course, her mother isn’t really there, and the house in Rook Hill is empty. It is no longer home without her parents, but nor is Lady Isobel’s house home, because the Quinn family does not love her. This theme is especially apt for a lesbian retelling of Cinderella, since many LGBT people are rejected by their family of origin, and end up making their own family. Aisling’s world does not seem to share this stigma, but nor has her home been a loving one since her mother’s death. Ash is an understated retelling of Cinderella, made up of a good blend of the traditional fairy tale and Lo’s own reinvention and additions. But it is the sweet, slow-burning romance at the heart of the tale that gives this retelling life. For as long as the people of Fairfold can remember, the horned boy has slept in a glass coffin, deep in the woods. Nothing anyone says or does can wake him, though bad things are known to happen to those who deface his resting place. As children, siblings Hazel and Ben played around the coffin, making up stories about the prince who lay sleeping inside of it, both half in love with him. Neither ever dreamed for a moment that he could hear them, or that he would ever wake up. The humans of Fairfold, and the Fae who live in the woods around their town have long had an accord, but the strange things that have always happened in Fairfold have begun to be stranger, and more dangerous. Then one morning, the horned boy is gone from his coffin, and the long peace between human and Fae is shattered in an instant. Old promises and debts are called in, stoking simmering feuds and ancient resentments to life. Hazel is recalled to childhood dreams of knighthood, slaying monsters and protecting the weak, while Ben must grapple with the faerie boon his mother accidentally won for him, which has proved as much a curse as a gift. And Jack, the changeling who lives among the people of Fairfold, and Ben’s best friend, finds himself caught between his human life and his Fae heritage. The Darkest Part of the Forest is an eerie fairy tale that builds on recognizable elements of traditional lore while also incorporating a contemporary setting and modern concerns. Black also has her own unique twists, such as a human woman who demanded the return of her child from the Fae, and then had the temerity to keep the fairy child as well, raising them as twins. Fairfold is, on the surface, a seemingly normal American town with a quaint New England feel, but as the story progresses, its more unusual aspects become ever more prominent. The town has a seductive mythos and a well-developed mood that sends a shiver down the spine. The Darkest Part of the Forest benefits from a deep back-story, the flash-backs to which only occasionally cause the pacing to lag (indeed the acknowledgements hint that Black struggled with how to make this complex plotting work). Layers of supressed memories and half-forgotten promises litter Ben and Hazel’s less-than-idyllic childhood, and their habit of keeping secrets and trying to protect one another serves them ill when they most need to be a team. Things that have long gone unspoken between them begin tumbling out into the open at inopportune moments, forcing them to reckon with what has driven them apart. Their complex relationship is one of the strongest aspects of the story. Thematically, Black examines dreams and the bargains we make to achieve them, and the ills we are willing to overlook in the trade. The people of Fairfold have long tried to pretend that their unusual home is normal, and that they are safe if they just obey the rules. But in many ways they are not safe so much as they are habituated to the danger, and they rationalize their own safety by finding fault with the victims that are taken in their stead. The awakening of the horned boy forces them to reckon, however reluctantly, with the drawbacks inherent in the bargain they have made by living in a magical place. 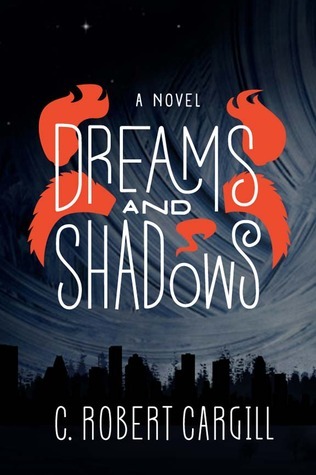 For Hazel and Ben, their fictional prince from stories spun in childhood becomes overlaid with the all too real and possibly dangerous supernatural being that awakens from his resting place. 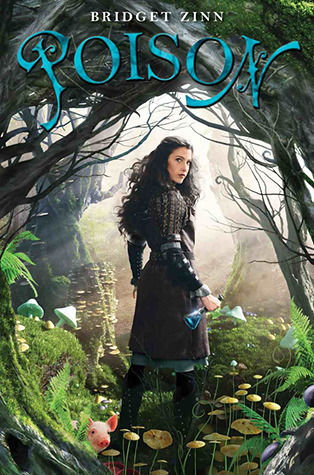 As with Black’s previous book, The Coldest Girl in Coldtown, The Darkest Part of the Forest stands strongly alone, a well-developed fantasy in a sea of series. In 1953, twenty-year-old Boy Novak flees her abusive father in New York, landing in the small town of Flax Hill, Massachusetts. Everyone in Flax Hill is an artisan, whereas Boy has no special skills to speak of. She drifts from job to job, and man to man, but keeps coming back to Arturo Whitman, a jewellery maker with a young daughter called Snow. More in love with the idea of being Snow’s mother than with Arturo himself, Boy nevertheless agrees to marry him, becoming the stepmother of a beautiful and sweet-natured girl who is adored by her entire extended family. But when Boy gives birth to her own daughter by Arturo, baby Bird cannot live up to the Whitman’s exacting standards. Suddenly Boy no longer has it in her to love Snow, who she now sees is beloved by her grandparents largely for her particular brand of beauty. 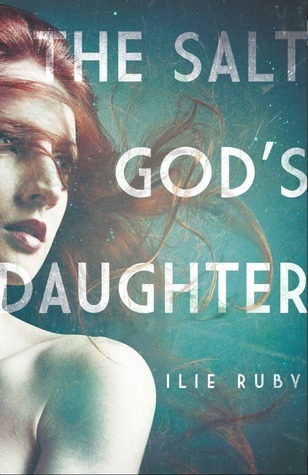 Driven apart by this family rift, Boy, her daughter, and her stepdaughter must all face the terrible power of appearances. 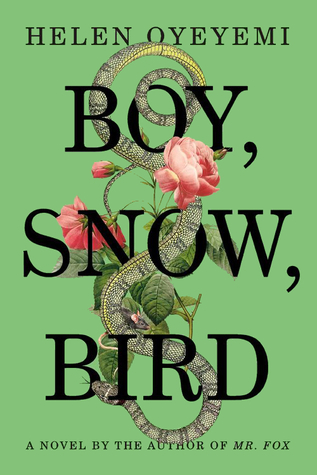 Slow-paced but captivating, the first part of Helen Oyeyemi’s Boy, Snow, Bird is narrated by Boy herself, as she recounts the escape from her abusive father, and settling into her new life in Flax Hill. Events are largely quotidian, but there are occasional strange happenings, particularly when mirrors are involved. This magical element is largely symbolic rather than significant to the development of the plot; the obsession with surface appearances turns out to be a deep one in the Whitman family that Boy marries into. Magical events are never so concrete as to be provable, but they pervade the story nonetheless. The second section of the story is recounted by thirteen-year-old Bird, who has been raised separately from her half-sister Snow, but retains a powerful curiosity about her. After discovering a letter addressed to her from Snow hidden in her mother’s jewellery box, Bird and Snow begin a covert correspondence eventually culminating in their first meeting since childhood. This section is shifting and slippery, as Bird slides from first person to speaking about herself in the third person, to exchanging letters with her sister. I expected the final part of the story to rest with Snow, but the narration passes back to Boy instead as the story struggles to regain the momentum it lost in the middle. It is Boy who is tasked with recounting the awkward Thanksgiving dinner that finally breaks open the tensions that have been brewing in the Whitman family for generations. And even Boy, who thought she knew her heritage, is forced to re-examine her assumptions when her best friend, reporter Mia Cabrini, uncovers a long-buried secret about her abusive father. Unfortunately, this final reveal does not fit in well with the rest of the story, and what is intended to provide closure and reunion fractures the story irreparably instead. Oyeyemi draws equivalencies between race and gender here that simply do not stand up to scrutiny, and she handles it with none of the sensitivity and depth she brings to the rest of the story. It is no coincidence that this is also the shortest section of the book; Oyeyemi has simply not done the necessary work to integrate this unexpected twist. Despite a number of obvious influences and references, Boy, Snow, Bird is only a very loose homage to the tale of Snow White. Boy grapples with her role as the “evil” stepmother to a child who has been taught all her life to believe in an ideal of beauty that excludes Boy’s own daughter. It is less of a retelling and more of an allusion to the question of beauty and vanity that lies at the heart of that story: who is the fairest of them all? Oyeyemi handles these topics masterfully, but falters in the end, leaving this book without the conclusion it deserves. 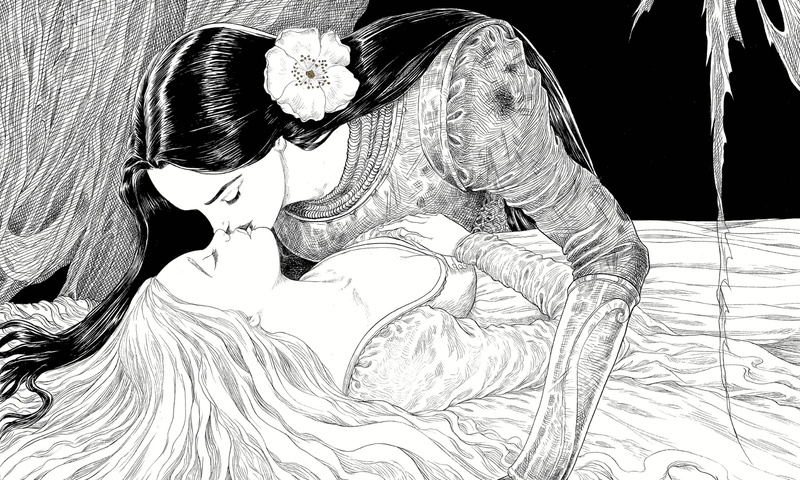 Despite this striking illustration, The Sleeper and the Spindle is no lesbian love story; the Queen has a handsome prince waiting to marry her back home, though he is never pictured. This misleading attention is the only respect in which readers may find themselves let down by this story, which is not what early coverage of this title may have led you to believe. With Gaiman’s strong writing working so seamlessly, in both books it is easy for the art to take centre stage. 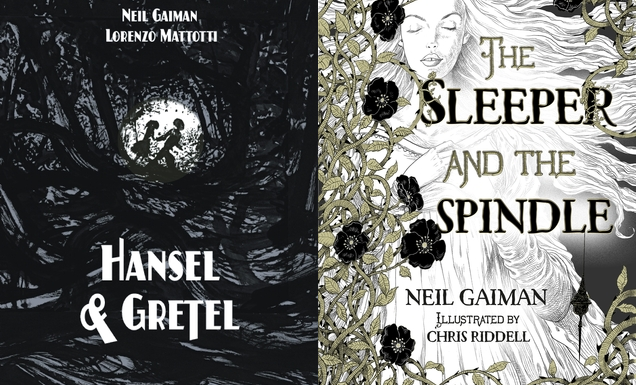 The Sleeper and the Spindle is illustrated by Chris Riddell, who also did the drawings for the UK edition of Fortunately, the Milk last year (the US edition was illustrated by Skottie Young). However, the mood is entirely different from the zany images Riddell produced for that book. The black and white drawings here are graceful and minutely detailed, subtly accented by shimmering gold highlights. The story features a young Queen, whose kingdom is endangered by the spreading sleeping sickness that plagues a neighbouring realm, and threatens to spill over into her own land. Assisted by three dwarves, she passes under the high mountain range that separates the two nations, and sets out to rescue the sleeper from a castle encased in thorns. This epic quest gives Riddell broad scope for his powers, and he more than delivers. Indeed, the entire book is an exquisite work of art, with beautiful end papers, metallic ink accents, and a translucent dust jacket that allows vines and roses to overlay the sleeper on the cover. 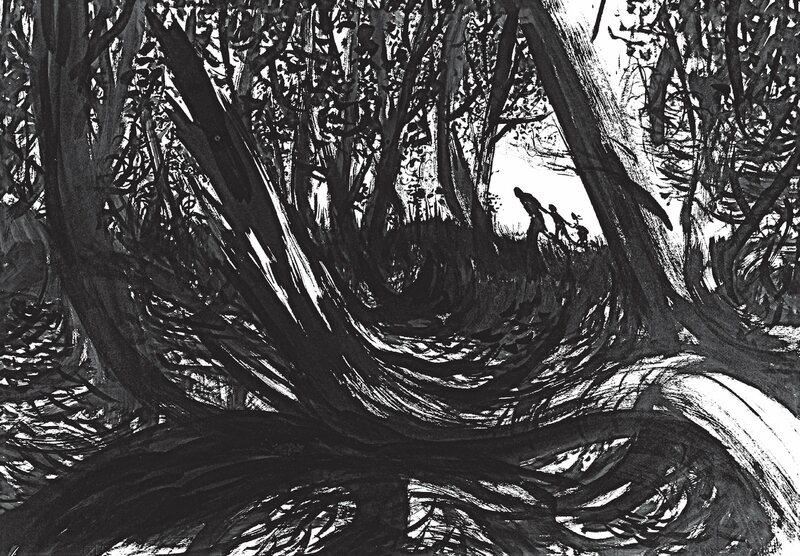 Painted in lush, dark India ink, Lorenzo Mattotti’s work in Hansel and Gretel is also black and white, and yet could not be more different in style from The Sleeper and the Spindle. Whereas Riddell’s work is delicate and detailed, Mattotti is boldly minimalist, relying on a masterful use of positive and negative space to create his images. There are a number of beautiful double-page spreads in The Sleeper and the Spindle, but in Hansel and Gretel, text and image alternate constantly, so that every illustration is able to take up two full pages. However, even the text-only pages are beautiful, featuring flowering vine motifs in the corners, and bold, red dropped capitals that are the only hint of colour in the entire story. The book’s design has a modern minimalism, but is no less beautiful than its more opulent sibling in its own way. Like the illustrations, the text of the story is deceptively simply, but the starkness is chilling. The woodcutter’s dilemma is created by war and famine, leaving the man unable to provide for his children. As in the original Grimm’s tale, the woman who advocates for the abandonment of the children is their mother, not their stepmother, making the tale that much more disturbing. However, Gaiman retains the reluctant father, who his persuaded by his wife to do something terrible; in Grimm’s, both parents are complicit in the decision. These narrative choices strike a nice balance, creating a tale that is at once haunting and hopeful. The Sleeper and the Spindle is the longer and more complex tale, perhaps better suited to a somewhat older audience that has the patience to sit through a lengthier story. But as usual, Gaiman’s works defy easy categorization for age groups, appealing to adults and children alike.